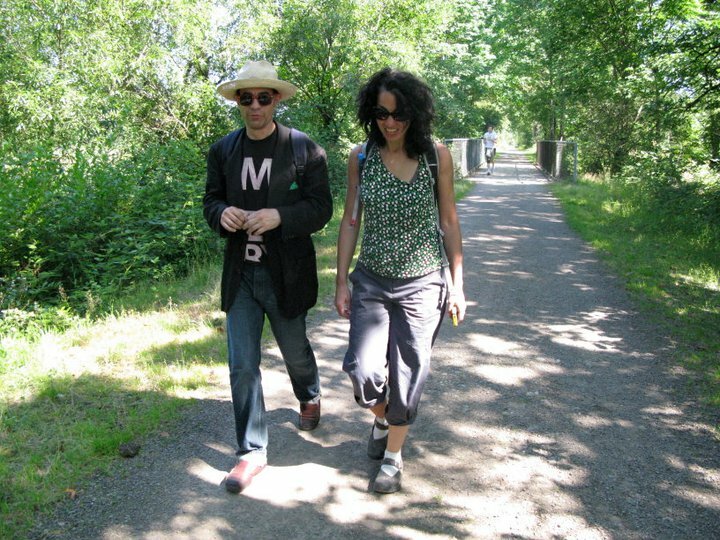 Many Long Walkers have been busy on projects boosted by our collective experience this summer, Jim Demetre among them. Not long after The Walk he pledged himself to the spirit of walking and has decided to take up my mantle during the months when I’m more likely to be hibernating. So, without further ado…. For four days and three night this past July, I walked forty-five miles with artist Susan Robb and fifty others from Seattle’s Golden Gardens east to Snoqualmie Falls. The journey was filled with revelations. Along the way, I was forced to conclude that my ideas about art were inadequate and badly in need of revision. (But that’s a story for another time.) A more important discovery was about the human race; the evolution of our species most certainly took place as our ancestors wandered about the landscape engaged in lengthy conversations both practical and cosmological. How else could I explain the strange, yet familiar euphoria we experienced roaming those trails, alternately bucolic and industrial? In the spirit of Susan’s Long Walk, I would like to invite each of you to accompany me on a short walk around Seattle’s Seward Park. I circle the perimeter of Lake Washington’s old-growth peninsula regularly and would be delighted to have you join me one morning or afternoon for some walking and talking. All individuals and conversation topics are welcome. To schedule a walk, write me at demetre66@yahoo.com.